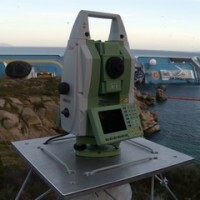 Following the run aground off near the “Isola del Giglio” (Tuscany, Italy, January 13, 2012) of the cruise vessel “Costa Concordia”, a monitoring system for handling the security of the SAR (Search and Rescue) operations and for the control of the ships’ movements/deformations during the subsequent defueling and recovery phases has been progressively installed and improved. The main goal of the project was to identify and intepret dislpacements/deformation of the vessel wreck to support the recovery operations. 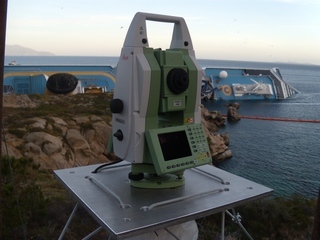 CNR IRPI has installed, in collaboration with Leica Geosystems, a monitoring network based on two Robotic Total Stations (RTS) to measure movements and deformation of the emerged portion of the hull. The network was composed of 23 prisms (targets) installed on the ship, along with a reference points system for measurement compensation. The system works H24 operative and the availability of punctual tridimensional data with a high sampling frequency and high precision have made the network one of the key elements for the comprehension of the hull’s movements. Monitoring results were used to analyse the behaviour of the vessel during all the recovery phases. Moreover, conceptual and mathematical models were derived to interpret the response of the vessel structure to external forces, as for example adverse meteo-marine conditions. Periodic reports on the status of the vessel to support Civil Protection operators during the emergency. Publications: Manconi, A., P. Allasia, D. Giordan, M. Baldo & G. Lollino, Monitoring the stability of infrastructures in an emergency scenario: The “Costa Concordia” vessel wreck. In Global View of Engineering Geology and the Environment – Wu & Qi (eds), 2013 Taylor & Francis Group, London, ISBN 978-1-138-00078-0. The project has demostrated how methods and strategies adopted in the field of geo-hydrological hazard, in particular to control displacements/deformation relevant to landslide phenomena, can be exploted in critical situations and unexpected emergency scenarios.